In conjunction with ‘GOMA Q: Contemporary Queensland Art’, emerging writers had the opportunity to enter the ‘GOMA Q’ Emerging Writers Competition, launched on the opening weekend of the exhibition. A judging panel comprised of the Emerging Creatives team and the QAGOMA Blog coordinator had the difficult task of choosing a winner and four talented runners up from the many high quality entries about the ‘GOMA Q’ exhibition. Anna Jacobson was one of the four runners up and her blog is published below. Entries from the two remaining runners up will appear on our Blog over the coming weeks. View the winning entry. Two figures lie in unrest, seeming to comfort the other but not quite touching, the coloured cloth morphing into a jungle beneath them. They wear grey long-sleeved shirts that are just visible, alluding to their emotional state of sadness, hopelessness or depression. 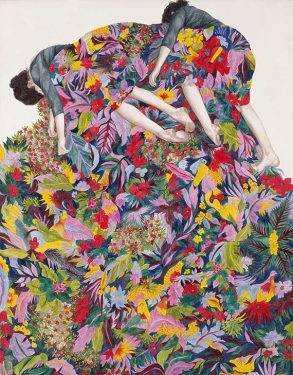 Their limbs fall and their feet turn into the fabric of birds, tropical plants and foliage as though trying to enter the world of the bright print, taking solace from the colours wrapping themselves up. The oil painting is called Jumble 2015 by Monica Rohan and is part of ‘GOMA Q: Contemporary Queensland Art’, which features a wonderful mixture of emerging and established artists. 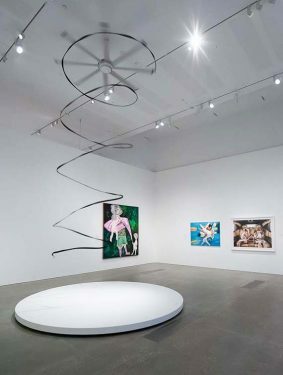 Born in 1990, Rohan is one of Queensland’s emerging artists who graduated from the Queensland College of Art in 2011. Looking at Rohan’s paintings and reading the ideas behind it, I felt an instant connection. The figures throughout this series of four oil paintings appear to wrap themselves in the bright colours as a way to combat the anxieties of everyday living and overwhelming situations. The contrast of the bright, colourful fabrics against the agitated and brooding poses of the figures create tension in the work, opening up stories and potential narratives behind each in the viewer’s mind. 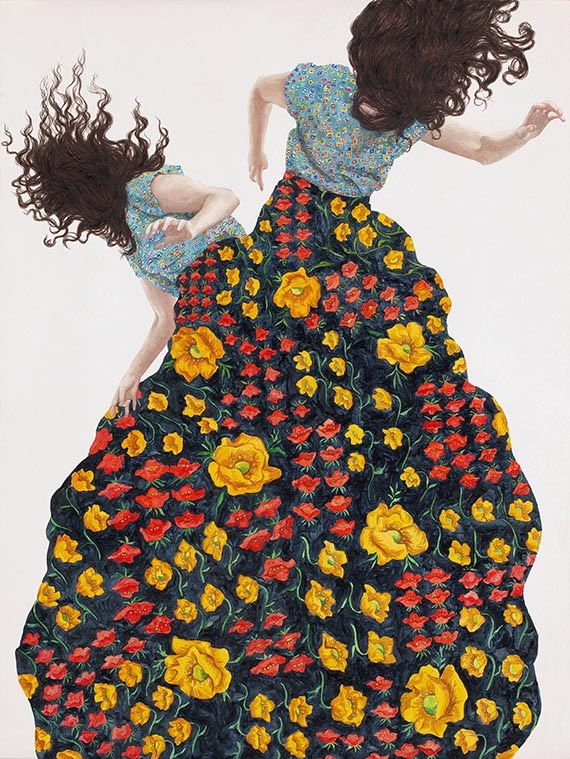 Rohan’s process involves taking photographs, featuring herself as the model, and painting from them, adding a touch of the surreal that can be seen in the elongated limbs of the figures and extended swaths of fabric. The figure’s faces are hidden by hair or turned away into the colourful fabric. Clues as to the anxiety of the figures are evident in the wild hair and agitated movements. For instance, in Bluster 2015 the figures appear in a battle, while not physically touching one another. In Over Reaching 2015 the figures are again in opposition but this time, pull away from each other, revealing inner conflict. It is interesting to see how the curators have ordered the artworks for display. When read from left to right, the two figures coil in moments of unrest and are then separated by battle as they toss in pairs throughout this series. For example, Yeah Right Ok 2015 depicts two figures curled up in fabric and not quite mirroring the other at either end of the material, Bluster 2015 shows the battle between selves, Jumble 2015 depicts the two figures lying down almost to comfort each other but again not touching and the final piece Over Reaching 2015 shows the figures pulling away from the selves in opposition. However, this series could be read from right to left as well, or one image may be chosen to draw meanings from. Rohan tackles the concept of anxiety and other difficult emotions through surreal compositions and bold colour. Her work has currency and is important in combating stigma, giving voice and visual expression to these often hidden conditions. I strongly encourage you to visit ‘GOMA Q: Contemporary Queensland Art’ to discover Rohan’s work and to see the many other thought provoking artists on display. Anna Jacobson is a Brisbane artist and writer who works across poetry and photography. She is currently undertaking a Bachelor of Fine Arts in Creative and Professional Writing at the Queensland University of Technology and was shortlisted in the Lord Mayor’s Photographic Awards in 2014.